Atul, like Parsa, is now the Design Director of his own firm, Design Incubator. He and his wife live happily in Bombay. That’s what I love you for !!! “In Sem 2 we were going around” well well well???!!! I have documented evidence that you blamed me for flirting with women whose names start with K in Sem 2. 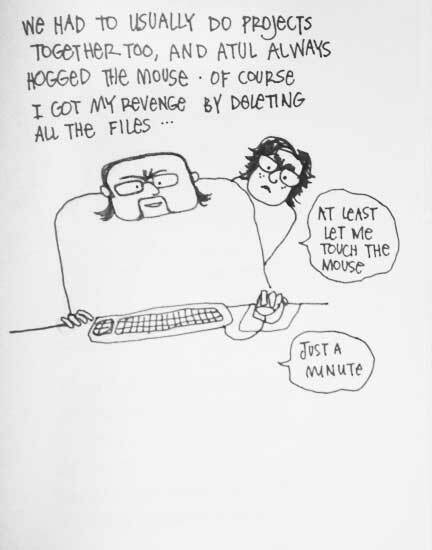 Looks like you were the one who was doing all the talking later while I hogged the mouse eh?? 😛 Talk about twisted facts and media gossip! 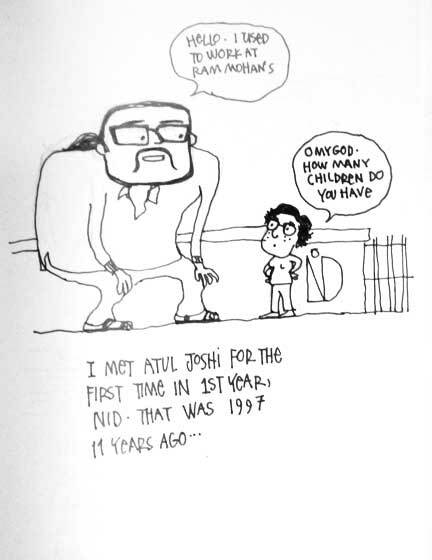 atul – well i deleted some frames in the middle, wasnt sure how they fit in the story! but i let you have the last word in the last frame didn’t i? and when did i ever document facts? they’re facts seen with my eyes = subjective!! Oh sorry, That was me, Gautam..
That trivendrum trip was too funny. And to prove that I was awake through out I will narrate Facts As They Happened. 1) Gautam Singh had a cold and he carried a only towel that he used as a snot rag, bathing towel, Hema used it to wipe her makeup and Gautam used it as a biological weapon to spread his virus around the trian to all the little mallu kids. 2) We had 50 rounds of Medhu Wada and got halted on Tadpatri Station because of a communist strike. Sunandini had to offer her Bengali communist contacts and somnath sengupta’s name to defuse the situation. 3) Hema carried 3 large suitcases, one full of clothes, another full of swimsuits and a third full of cosmetics. Let me remind you, it was a 5 day trip only, with not chance to swim anywhere. Hema had an ‘unnatural’ attraction towards Bill Plimpton and had ‘plans. 4) Hema had to run behind chug-away trains with facewash and cosmetics on her face. She used to get off the train every 2 hours, as soon as a station arrived to take care of her “delicate skin”. An old, fat, hairy mallu man died with cardiac arrest when he saw Hema with white-green shiny cream on her face at night in the trian. He thought it was his grand mother’s ghost. He was survived by a wife and 3 little mallu kids. The 3 little mallu kids died after being infected with Gautam’s virus, and the wife fell in love with Gautam. Everyhting was very tragic and surreal. 5) Hema got off the Trivendrum station and 25 mallu men approached us with a name plate “Haymmaa” and saying exactly the same word very loudly. Thus Hema got rechristened as Hay-maa! All this documentation goes to prove I was well awake and never uttered the words “I will crash out” as gossiped by some tabloids. This is as funny as it can get, thanks all of you! hello. i wasn’t even on that trivandrum trip!! how could i use my bong contacts?? well… Suu, you are well connected. You dont have to be there-there to do these things. Tumi Gacher Pata, Tumi Zhikir Mikir. Amaki Chomke dao, chomke dao, dao, dao.. daooo….. daoooooo!!! Who is this anonymous person? Web stalkers freak me out man. It’s like people listening to your phone conversation while traveling in a mumbai local. hahaha,this is simply fantastic soo. i am in love with you and your stuff. Hahahahahah… just love inktales, hope by the time my kids can read, you will have Inktales like Haanda-Bhonda / Nonte-Phonte series! Atul, I am really impressed with your Jhikir mikir song!! Miss you both!! 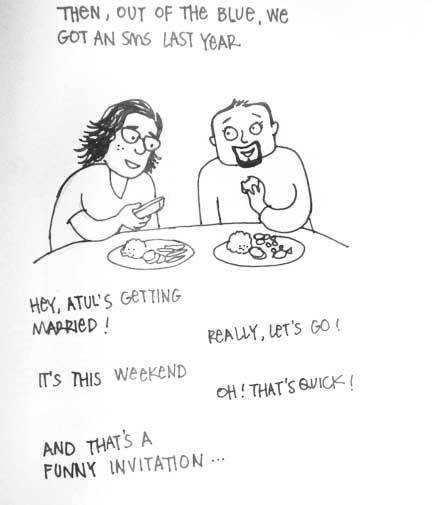 Atul – Gautam’s trivandrum story reminded me of the time in first year when you and Tuttu slept for 48 hours at a stretch and got up after 2 whole days?? so i’m sure you slept through the train ride to Trivandrum! All> Please notice that in Atul’s account there is NO record of atul doing anything!!! Cool stuff, really awesome. I am quite amazed with the kind of simplicity that the drawings ooze.yet an another masterpiece. hahaha i agree with gautam. going around with atul even for a day is too much. i once went with him in the train and he insisted on singing songs that he didnt know the lyrics to and expected me to fill in the blanks !!!! 48 hours of sleep! Is Atul kumbhkaran’s kaliyug avatar? super impressed. Zainab, I thought you were too busy riding elephants in Trivendrum (and crushing them) to remember anyhting! 🙂 hahaha ! How have you been poonawalee? Guys this is hilarious. 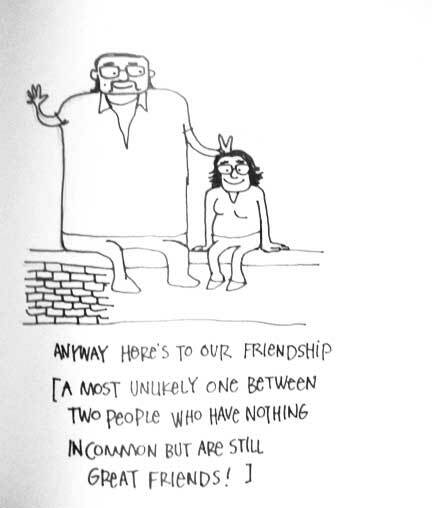 Sunandini you are a genius and Atul Joshi your account of the train journey was too funny. This blog needs to be published as a book. 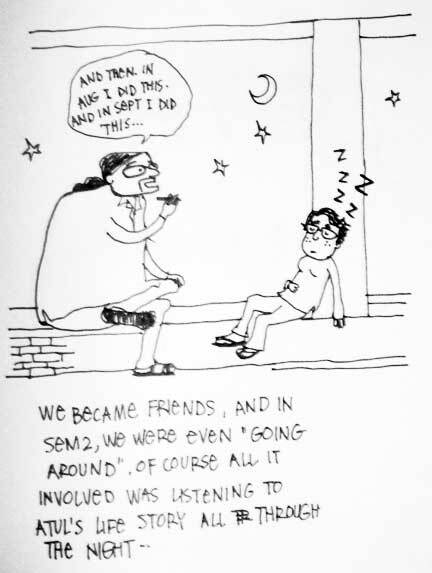 Megha- yes, i do remember you. Prash- first it was cuppa, seem to have reconverted to the ‘cutting’ eh? Nice site man! very intereswting stuff. Sunanda- Wow! you are a walking brand. How does it feel when someone says, mmm shall i wear a gucci or a sunanda today for the party? 🙂 great going in seine deustchland! Toinks- what does it exactly mean? Who are you? What are you? Why are you? Rukminee Potter- Hows it going? Where are you going? Why are you going? Such less food on Koko’s plate? bonu> Watchin’ mah weight honey!! soo> y’know whose comments(read : evidence) are missing on this post… the HEMA of Nazareth! This positively should be a book, I agree and hey Mister AJ I do not qualify for a response? whoa!! 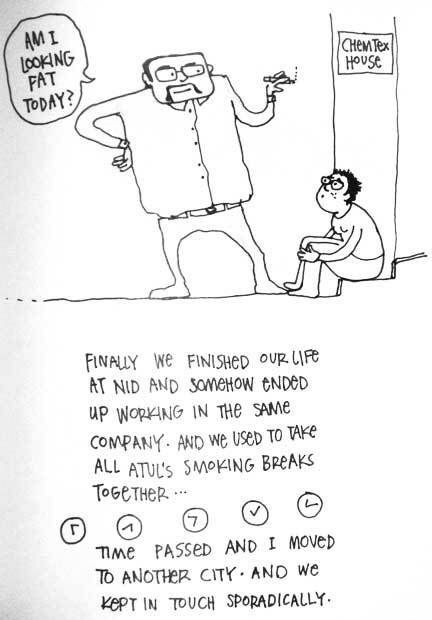 !..one of the best pieces i have read so far…soo awesome , u do need funny samples like atul for entertainment !! !